Apple says its latest iPhone models released has a camera that is packed with new technologies like iSight, to help every user takes more great photos and easily shoot amazing videos with the newly added features including the option to capture 1080p full HD videos at 60 fps. 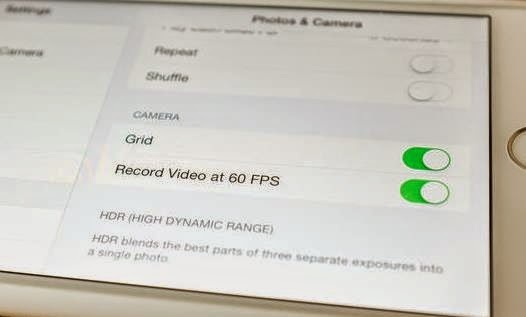 Previous iPhone versions normally captures video in a suitable 30 frames per second (FPS). Surprisingly, the number doubles with the latest Apple smartphone releases -- the iPhone 6 and iPhone 6 Plus. While both new models are set to record in the traditional 30 FPS system, you can enable the new frame rate or full 60 FPS recording capabilities with just a few taps. 2. Scroll down and tap on Photos & Camera. 3. You will see at the bottom of the options listed, a switch to turn 60 FPS video recording ON/OFF. Simply tap that switch to enable and activate the feature. When enabled, you can use the application to record video as you normally would. You can see variations in video quality during the playback, with the 60 FPS clips apparently being smoother. However, one downside of this new feature is an increased size of the saved video files. No need to worry though because you can always turn the 60 FPS video recording feature OFF anytime.